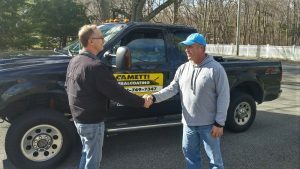 Steve Cametti is well known by homeowners for his extra attention to sealcoating driveways – he is neat as a pin. Steve focuses on detail, edging, and trimming. As a result, he makes sure that the sealcoat completely covers the asphalt without spilling onto your lawn, marble walkway, or garage door. For homeowner references of driveway sealcoating, contact Steve directly at 781-749-7347. With flexible scheduling for commercial off-hours, we service many small businesses including strip malls, restaurants, apartments, churches, retail stores, and car dealerships. Below is a partial list of commercial sealcoating customers where we have provided parking lot and walkway sealcoating and demarcation. For commercial references of parking lot sealcoating, contact Steve directly at 781-749-7347.